A professor marries a nightclub singer, much to the consternation of his family and friends back home. An unemployed woman discovers an abandoned baby on the steps of an orphanage, and accepts an offer to take responsibility for the child in return for a job. Shortly after the United States enters World War I in 1917, a Broadway actress agrees to let a naive soldier court her in order to impress his friends, but a real romance soon begins. When a tycoon is accused of murder, the private eye tracking him finds himself roped in as an accessory and attempts to evade police, kidnapping a poetess along the way. Missing for seven years and presumed dead, a woman returns home on the day of her husband's second marriage. Seeking US citizenship, a Viennese refugee arranges a marriage of convenience with a struggling writer. The wife of a publishing executive mistakenly believes that her husband's relationship with his attractive secretary is more than professional. A psychiatrist agrees to hypnotize his friend's girlfriend in order to convince her to accept his proposals of marriage, but she ends up falling for the psychiatrist instead. A hard-working, white-collar girl from a middle-class family meets and falls in love with a young socialite, but she soon clashes with his family. Feeling unwanted by his wife and children, a wealthy industrialist hires an unemployed young woman to pose as his mistress. James Stewart ... Peter Morgan, Jr.
Charles Coburn ... Peter Morgan, Sr.
Francey: You could let me say something. I'd like to make an impression too. Peter Morgan, Jr.: Oh, well, you don't have to say anything. Peter Morgan, Jr.: No. You speak for yourself - and very elegantly too! a romantic comedy. maybe, a perfect one. because it has all expected ingredients. and, sure, the right actors . it is amusing and touching and courageous. 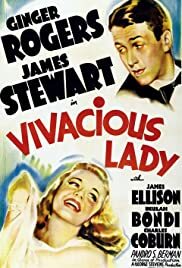 and James Stewart gives his the best in a role who, at the first sigh, reminds many others. because it is so simple. a dysfunctional family, a seductive young woman, a secret and the glamour of Ginger Rogers. all as part of a so contemporary film, ironic, great and real lovely.